Our Skully needs some cheering up (this is the last weekend of fun before Halloween…) Get to your local Halloween Alley, find a Skully and click a selfie with him to get him grinning again. Tag @HalloweenAlley, use hashtag #FoundSkully to get a chance to win! We are giving out gift cards every day until Halloween. 52 Halloweeners have won gift certificates already! Keep sharing your #FoundSkully pictures and you might win some! 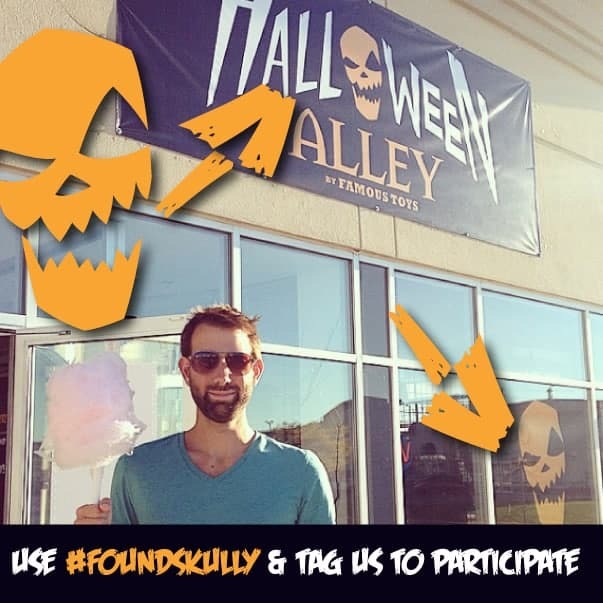 Share your photo with Skully on our Facebook Page, Twitter and Instagram with our hashtag #FoundSkully, and tag @halloweenalley between now and Sunday, October 30th. Each photo you share will count as an entry into our contest so the more you share, the more chances you’ll have to win! Checking out one of our stores? Picked up a costume? Found Skully on the shopping bag? Share a photo each time to increase your chances of winning! Gift certificates worth $250 to be given away! The winners will be announced on Monday, October 31st, so stay connected for the results! Subscribe to our newsletter at the top of this page! Contest valid for residents of Canada only. Good luck to all of our participants. Win an iPad in our 2016 #MyHalloweenAlley Contest!